Our sweet Joseph just celebrated his first baptism anniversary. One trip around the sun, one whole year a Christian. It’s a big milestone in our family. I’ve written about Thomas’ and Sam’s baptism anniversaries, too. But I always find that these days sneak under the radar, despite circling the dates on the calendar and trying to plan a something-special to celebrate their big days. 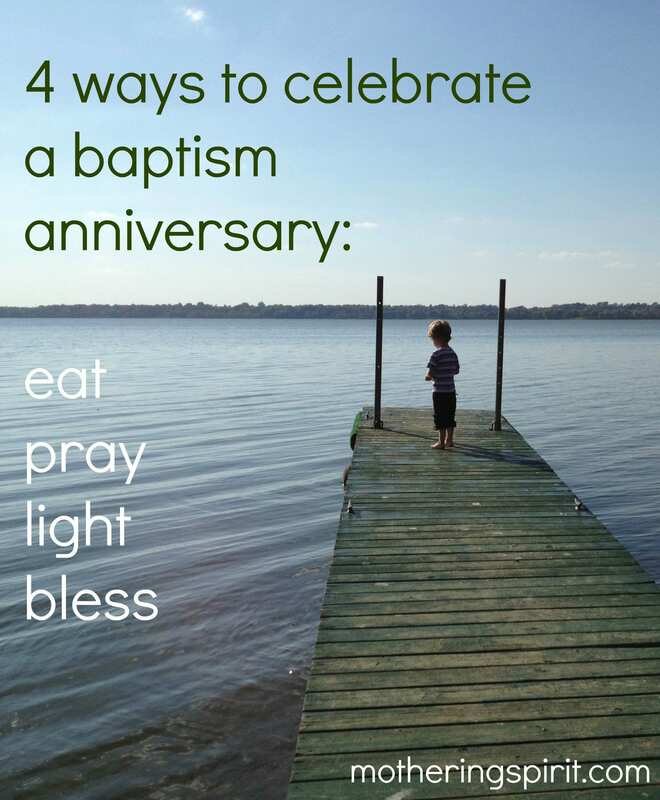 So here’s my simple solution: four easy ways to celebrate a baptism anniversary with children. Grab one or grab ’em all. 1. Eat a special meal or delicious dessert. FEAST. The Christian answer to every celebration. Make the child the center of the day. Make a fuss. Let him pick the dinner he wants (even if everyone’s stuck eating chicken fingers) or surprise him with cake and ice cream for dessert. Pull out the photo album after dinner, and re-tell the story of his baptism: why you chose the godparents, what friends and relatives came to celebrate with you, what happened when the sleeping baby encountered that surprising splash of water and everyone smiled. If there were ever a reason to pull out the fancy dishes and nice candles and a real tablecloth, the anniversary of being claimed as God’s own and cleansed from original sin and welcomed into the worldwide church has got to be a pretty decent one. Worth washing china by hand after bedtime. 2. Pray a blessing for a baptism anniversary. I discovered this prayer on Sam’s 1st baptism anniversary, and each year we (try to remember to) pray it with each of our kids on their special day. It’s lovely to watch how the whole moment changes when you focus on one child during prayer and lay your hands on them to bless them. Trace the sign of the cross on the child’s head and heart. Place your hands on the child’s head or shoulders. 3. Light a baptismal candle. If you received a candle at your child’s baptism, dig it out from the back of the drawer. Or simply set a white candle at the dinner table to remember Christ’s light. Talk about the symbols of the sacrament – the candle, the water, the oil, the white garment – to bring their baptism day to life before their eyes. Lighting a candle sets a sacred mood and reminds the whole family that home can be as holy as church. 4. Trace a tiny cross on your child’s forehead. If all else fails (which it hasn’t because: baptism!) – or if the end of the day arrives and you suddenly remember that you forgot – fear not. The simplest blessings can be the best. Baptism reminds us that we are blessed and beloved simply because we are created by God and called by name. So even if you celebrate a baptism anniversary simply by blessing your child before bed, it is more than enough. It is…(wait for it)…an everyday sacrament. I love that prayer…definitely planning to borrow it for our next baptism celebration. Thanks for sharing how you do this in your family! These are such sweet and lovely ideas! My littlest was baptized on Pentecost and the rest of us were Easter Vigil a few years before, so we are lucky I think with easy to remember baptismal anniversaries 😀 Hope your little one had a wonderful day! Thank you for posting this Laura. As many other experience, my daughter’s anniversary is Today, thank God for calendar reminders. My husband and I love all four suggestions. I plan on incorporating #4 every night at our prayer time as well.